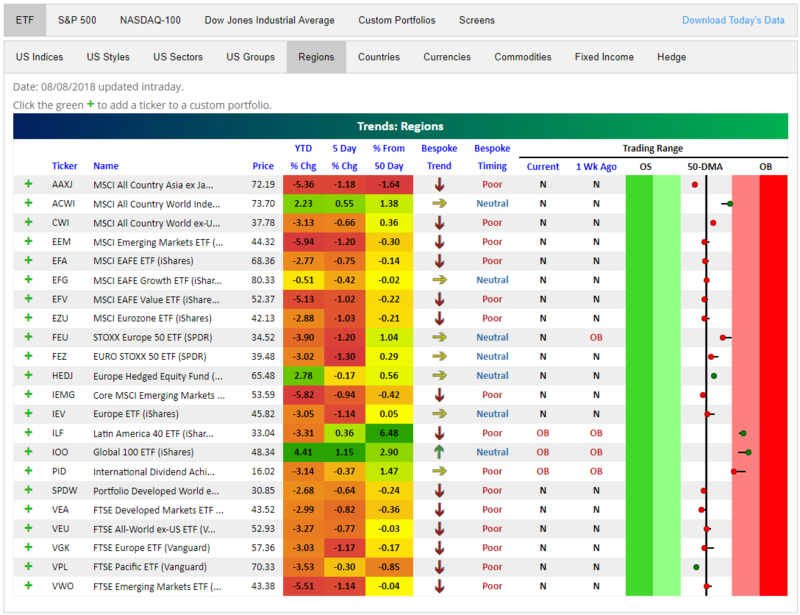 Our Trend Analyzer tool allows investors to easily monitor directional trends and overbought/oversold levels for a large basket of stocks or ETFs. This fully interactive tool is only accessible for paid Bespoke subscribers, but below we’ve taken some snapshots of the tool in action so you can 1) see what it looks like and 2) glean some market insights. 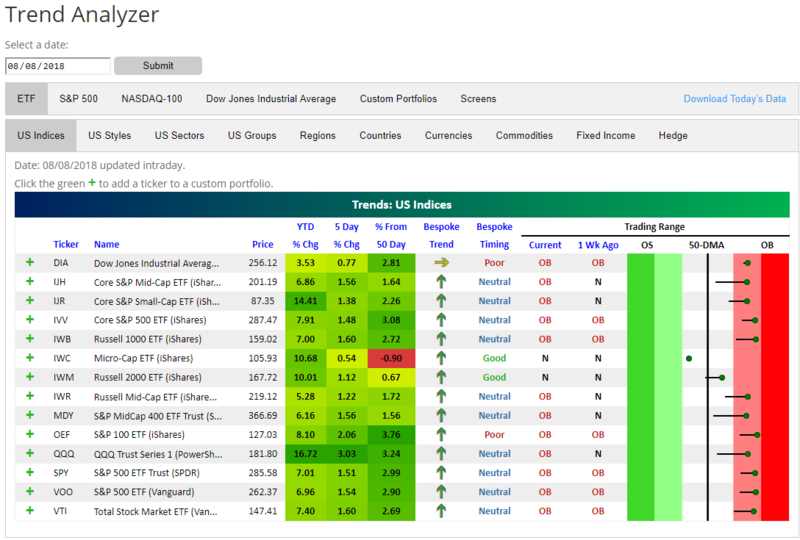 Note that subscribers with access are able to build custom Trend Analyzer portfolios of just the stocks and ETFs that they want to see. It’s a great way to monitor your portfolios and watch lists! If you’d like to read about how our proprietary Trend and Timing scores are calculated, please scroll to the bottom of our Trend Analyzer page. The main thing to point out in our first snapshot is that all but two of the major US index ETFs that we track are now in “overbought” territory, while the two that aren’t are neutral. These two neutral ETFs are both small-cap related — the Russell 2,000 (IWM) has just moved back above its 50-day moving average, while the micro cap ETF (IWC) is the only one below its 50-day. For US sector ETFs, you can see that every single sector is now back above its 50-day moving average, and all but two are trading at “overbought” levels. Materials (XLB) and Energy (XLE) are the only two sectors that aren’t currently overbought. Below we move away from ETFs and focus on individual stocks. 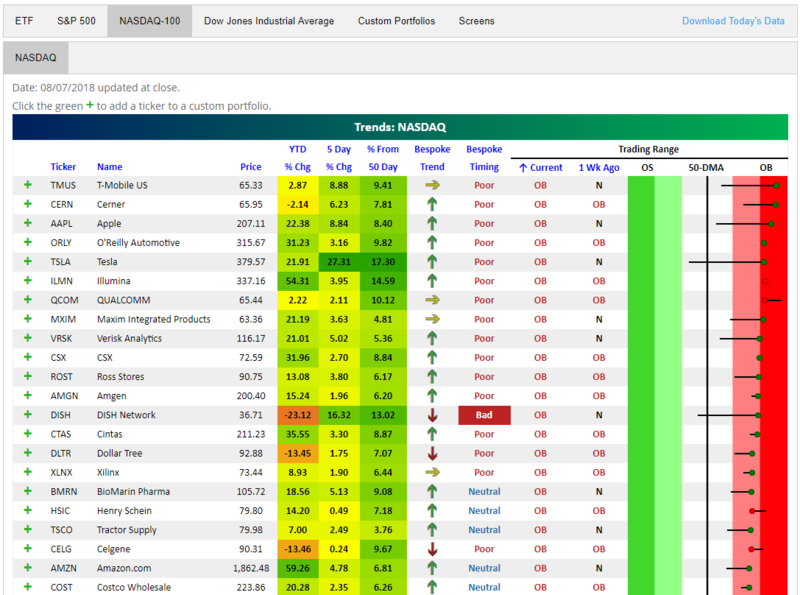 The snapshot below shows the Nasdaq 100 stocks that are currently the most overbought (most extended above their 50-day moving average in terms of standard deviations). When a stock is trading in the dark red zone, it’s more than two standard deviations above its 50-DMA. There are eight stocks in the Nasdaq 100 that are more than two standard deviations above their 50-DMAs, with T-Mobile (TMUS) the most overbought followed closely by Cerner (CERN), and Apple (AAPL). Tesla (TSLA) is now the fifth most overbought stock in the Nasdaq 100 after CEO Elon Musk tweeted yesterday that he’s considering taking the company private at $420/share. Moving away from the US stock market, below we show regional stock market ETFs from around the world. Here you can see that things don’t look nearly as bullish. Every ETF shown that has no US exposure is down over the last week, and nearly all of them are in the red year-to-date as well. Note that none are oversold, though. They’re mostly just trading right in neutral territory near their 50-day moving averages. Click here to try the Trend Analyzer for yourself! If you start a free trial to Bespoke Premium, you can even set up your own custom portfolios.